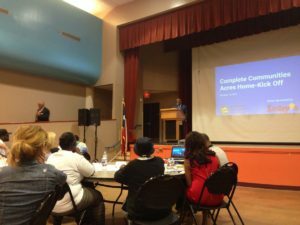 Houston’s Latitudes Environmental participated in the Complete Communities kick-off meeting for the Acres Home neighborhood held on October 18. Acres Home, commonly referred to as the “44”, is located approximately 10 miles northwest of downtown Houston. Mayor Sylvester Turner led the meeting, with welcoming remarks and introductions of key team members and stakeholders. This opening was followed by a presentation by Patrick Walsh, Director of the City of Houston’s Planning and Development Department. 1) What are the strengths of Acres Home that we should build on, and what do you love the most about the community? 2) What are the things you would like to change, or what are some challenges? 3) In 10 years, if Acres Home was a Complete Community, how would you envision it? Following the breakout sessions, presentations were delivered by group representatives. David Lewis, President of Latitudes Environmental represented his group in delivering a collaborative ‘vision’ for Acres Home. Latitudes is a local business and a key stakeholder, with Mr. Lewis owning several properties in the Acres Home neighborhood. Mr. Lewis began by describing the importance of taking a ‘master plan’ approach to revitalizing Acres Home. Positive change that allows the history of Acres Home's to endure in a new and improved economy and infrastructure. Latitudes is proud to be a part of an historic Houston Community. With the vast amount of undeveloped land, we now have the opportunity to identify large tracts of land within the 100-year floodplain (portion of Acres Home) to set aside for storm water detention basins, which could then be managed as public parks with hike and bike trails. These flood storage areas will be an absolute necessity, considering the inevitable future development in Acres Home. The general consensus of all participants is a future vision of a ‘walkable’ neighborhood, with access to new public transportation infrastructure and a flourishing economy. For more information on The Complete Communities Initiative, visit their website.